Well, long story short…started mountain biking in ’93 as a 13yo tagging along with my big bro. Continued with that through the 90s into early ’00s. Quit and did a bunch of bike touring around the west and across the country. That made me fit and I started road racing. Went pro. Didn’t much like that so switched to cyclocross. Loved it and had a stellar year. Quit again for no apparent reason. Built a yurt, got married, bought a cabin and some land off the grid. Started racing cyclocross again. Did 5 more years, 3 of which were pretty successful, but life and work on the homestead sorta took over and got in the way. Plus training lost it’s luster and I was getting towards my late 30s….time to quit again….which brings us to the present..as far as bike racing goes. Not much has happened worth noting on that front in a while. The gear making is a separate trajectory. I learned the basics of using a sewing machine from my mom when I was young. Didn’t do much with it until later on when I was motivated by a friend who did the Appalachian trail with some DIY gear he made. I made a few things for myself but didn’t go beyond that. Later in life I wanted some wool clothing and was shocked by the prices being asked for these items so I started buying old surplus blankets and making clothing out of them. These are some of my favorite items to this day. Anyway, this gear making sorta got me sucked into the DIY/MYOG (make your own gear) internet community…well, not an active participant, but a lurker, scouring old message boards, blog pages, and youtube vids. The wool stuff is cool and was what I was most interested in at the time but the real challenge was in making ultralight stuff. This led to making stuff for a buddy. I would post pics of this stuff on social media and that, almost on it’s own, led to people ordering stuff from me. I was still racing at the time so it was sorta “on the side”. When I quit racing I decided to focus on Timmermade as a business. It’s been slow to grow into a full time gig, but I love doing it. I’m honored to be apart of the outdoor gear cottage industry. It’s really where things are happening. The big companies are just following the market, not taking any risks, while the little operations are really thinking about things and making innovative stuff that really, truly outperforms the big brand stuff….often by a long shot. When out on the long trails and bikepacking routes the vast majority of people are using small shop stuff. Not just due to performance, but also because it’s often just one person, like me, making your gear. Not some big assembly line. Not that those produce bad work but they cut out the craftsman or woman that is passionate and sees the big picture. Cuts out true innovation and customization. For example, in my case, someone can simply email me and say “I want a pocket on the top of my head” and I say “Ok, cool.” Those interactions are lost in the big industry and the results of those interactions often result in brilliant innovation. I do all of my jackets and vests in custom made-to-order style. You tell me the dimensions that you want the garment to be and I make it to those numbers for the exact fit you want because we aren’t all the same size and dimensions. My sleep systems are generally aimed toward improving performance because as a one man operation I have the freedom to do so. Better performance usually takes more time and materials. Mass production is likely to give you what is cheapest to mass produce. what are your motivations to be an “off grid” gear maker. What are the challenges? First off, it should be noted that I don’t build 100% off the grid at this point. I spend half the year in upstate New York, where I live and build all Timmermade items with our domestic solar power. The rest of the year I live and work in southern Arizona, where ironically I do not have access to solar power at this point. However, as you mentioned, it is a major motivation of mine to make Timmermade 100% off grid. It’s not that I have anything against the grid, it’s just that the grid isn’t being used in a responsible manner. Humans are smart. It’s time we start being wise. It’s one thing to be smart enough to make all this technology. It’s another thing to be wise enough to use it in moral and ethical ways. Right now we are not. We are living in a human caused mass extinction, losing a conservative estimate of 12 species per day. Even in the eastern woodlands where the environment is inherently adaptable and has a long history of human influence, I can walk through my 10acre plot of forest and see at least 3 species of trees that are extremely threatened and likely to be extinct in my lifetime directly due to human activity. As we all know, 7 billion people on this planet are changing the climate on a global scale. This is REALLY delicate stuff that REALLY should not be messed with. There are so many things we do in our regular, modern homes that are so blatantly wasteful. Like refrigeration. We dump piles of energy into heating our homes. Then dump piles of energy into cooling a space inside that warm space back down to what is often the ambient temperature outside. What? We pump water from a source, purify it for drinking, pump it to our houses, pump it through our houses, defecate and micturate really high quality fertilizer into it, pump it away from our houses, dump the fertilizer in a landfill, and dump the water into waterway. Huh? Every home has dozens of laptop cords, phone chargers, and power cords using energy to convert AC to DC even though nothing is using the power. They are just there, using power for absolutely nothing because we can’t be bothered to unplug them. Anyway, in these times of apathy and ignorance where people corrupted by the idea of freedom will make up whatever reality they want to allow them to do whatever they want at the expense of their neighbors and the greater good, I want to go to great lengths to be aware, responsible, moral, ethical, thoughtful and so on….being off the grid not only usually means getting power from sustainable sources but also requires me to give thought to the way I use that power. Something very worth my while. As for the challenges of being off the grid, well they really aren’t that challenging. Yes it takes some thought and learning and physical input…but really not a big deal. For instance, we don’t use one amp of our solar power to move water in our place. We pump it out of our well and haul it in. It’s SO easy, with side benefits of being aware of how much we use, not having to worry about pressurized water system leaks, and getting a tiny little 10min workout every few days hauling a few gallons of water. Isn’t it ironic how much work we have electricity do for us in our homes for the sake of convenience while we go and dump our physical work into a stationary workout machine or pointlessly go in circles somewhere to stave off atrophy? Yeah there are some things that are limiting or less convenient being off the grid, but given the consequences of our way of life, it’s really worth taking the time and effort to do differently. As for making gear off the grid….it presents some challenges, but as stated above regarding general life, it’s well worth the effort. Of course, it’s really just one step of the process. There is the manufacture and shipping of the materials and the finished product, but if I can do just one of the steps in a more ethical way, I will…..and I think the folks who are out and about in our natural landscapes using gear like this are likely want to take care of that world and see gear “built with renewable energy” as attractive. What are you doing these days for activity, what fills up your soul? I still ride a little bit, just for fun, but I have been much more motivated by foot travel. Cycling will always be a passion of mine and I’ll always love it. However, it creates a very strange athlete. Highly developed cardiovascular system and major muscle groups, but almost shockingly underdeveloped in any of the small stabilizer muscle groups, joints, and ligaments. One of my major goals after hanging my bikes up was to try to balance my body out. Become proficient at my own natural movement. Been hiking a bunch, which also gets me out into natural landscapes…camping, living, moving. I hiked the 800mi Arizona trail last fall which has served to help build my body’s joints and ligaments up so that I can do some more running. 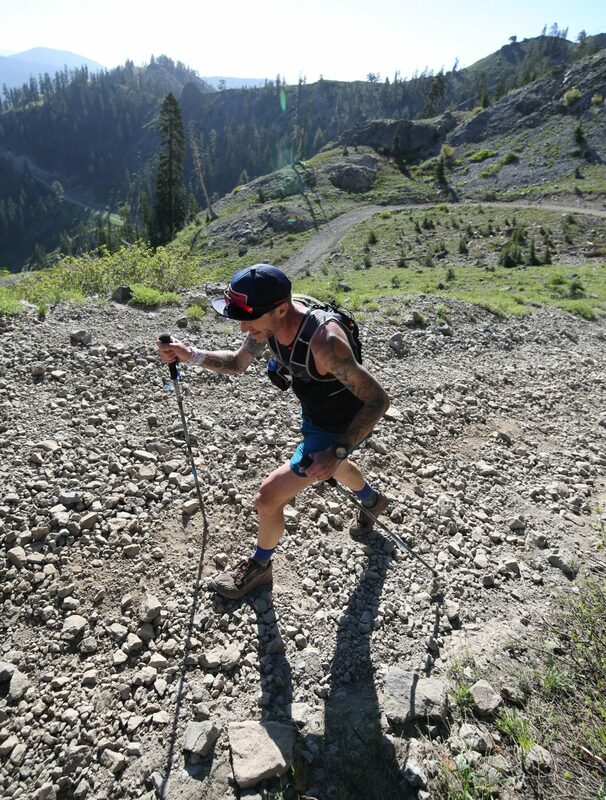 Last summer I did 4 running races building up to a 50k trail race. I really enjoyed these, especially the really technical ones that get you out there…where other modes of transportation can’t go. With the goal of “balancing out” I also have some interest in working in more upper body focused activity…as long as it doesn’t sacrifice too much of my endurance movement. Dan, Thanks so much for taking the time to answer my questions. Thanks for making some of my gear. I hope we get to share some trail soon!